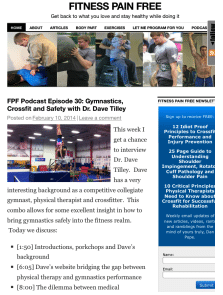 A upper body hyper extension type movement (partner holding legs, gymnast arches up) can produce 1000 lbs of force. The majority of gymnasts with lower back pain comes from too much lower back arch in the first place. This hyper extended lower back position at rest and excessive extending with skills is what leads to over load of the spine. If too much arch is part of the problem, doesn’t it make sense that we wouldn’t want to isolate and train this arch motion more, especially with high repetition and weight? My thoughts ride on the same wavelength for aggressive spine flexing exercises (weighted sit ups, knee hanging sit ups, etc) and aggressive spine rotation movement exercises (lying windshield wipers, Russian twists). From a lot of reading and learning more about how the core functions, I have greatly changed core conditioning program for our gymnasts. Also, rather than just pick apart the bad things I like to offer alternative solutions for what to do instead of lots of arch ups. Yes I do believe in training arch and hollow motions because it’s key for gymnastics, and yes we do plenty of the common gymnastics core strength exercises (when it can be done with good form). However, the way we go about it is key. I think a balance of strength for the core and core stability is required. This leads me to this gym quick tip. We want to make sure the core is functioning as one unit, using all aspects and not just the lower back muscles. This helps avoid improper technique and also trains more core function, rather than isolated anatomy or just the back extensors. I know it seems ridiculous (and caution about this with younger gymnasts) but the pelvic floor is a key component to core control as it makes up the bottom of the “canister” to help stabilize the spine. 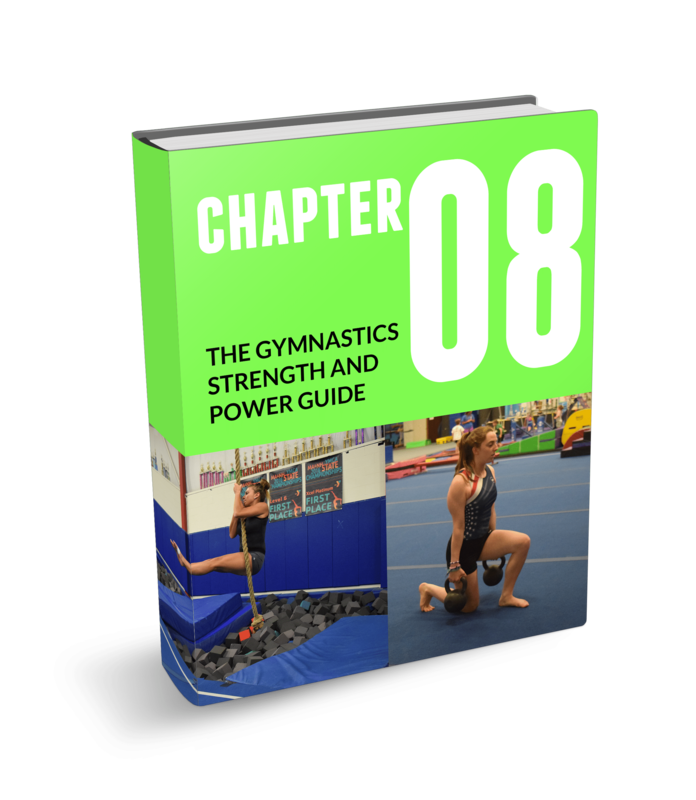 It’s common for gymnasts to have issues with urination during tumbling, and the concept of properly training the core for all aspects including the pelvic floor comes into play. 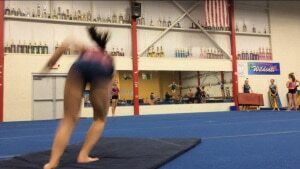 Every gymnast has different levels of strength and abilities to organize their core. We always want quality over quantity. If the gymnast is showing huge compensations or is struggling, have them simply bring their body more in on the block, reducing the length and demand. They should be on “the edge of their ability” for a challenge but not cheating, then they can progressively go out farther as they get more in control. Although it seems like a subtle difference in position, it has huge difference in terms of training the core and also reducing overload to the lower back muscles/spine. Her lower back is much more neutral with the hips engaged, she has control over the position, she is working multiple aspects of her core, and she reported no back discomfort. Teaching extension movements like this forms the base of a good global arch. We do multiple reps at shorter bursts of 10-20 seconds versus one long hold say for a minute or 2, working on finding that position and activating the stabilizers quickly. From here to train a more extended overall position we focus on glute control and hip extension, upper spine movement, and shoulder blade/shoulder motions on top of this solid core base that has been established. Other great alternatives are bird dog, glute and single/double leg bridging, single leg and double leg deadlifting, kettlebell work, and more. Give it a whirl, and it can be of huge benefit to build the core efficiently, spare the lower back of possible injury, and assist in gymnastics performance. This type of concept built into into all core training, training core control along with strength, using proper technique during extending skills, and continuing to be proactive about back injuries is crucial. Hope this was helpful, best of luck.